The Magic 8 Ball's predictions for winter weather. 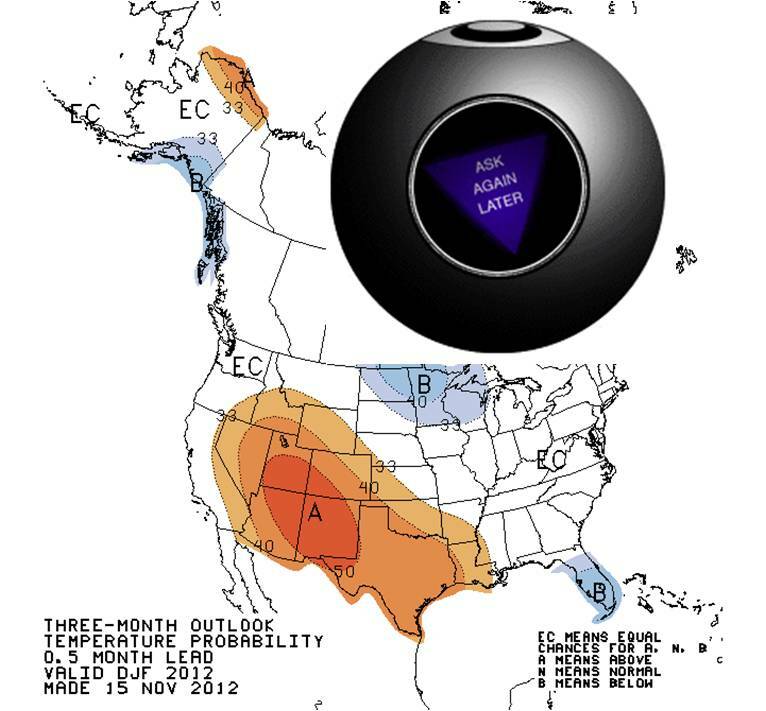 Three-month outlook temperature map from NOAA. The ridiculous changes in temperatures (30 deg F to 70 deg F to 20 deg F to 50 deg F???) and the uncertainties in weather forecasts made me slightly cranxious yesterday. I checked the NOAA Climate Center page and the three-month outlook is confusing for Western PA: both the temperature and precipitation maps show that there are equal chances for above, normal, and below average temperatures and precipitation from December through January. These model uncertainties made me think of the results one might expect from using a magic 8 ball to make weather predictions, so in this article I report the results from my testing of the magic 8 ball's ability to predict weather and answer tough questions.